I would say the dominant story of this year's NBA finals, two games in, is the drama of Miami's LeBron James and Oklahoma City's Kevin Durant trying to will their respective teams to victory. 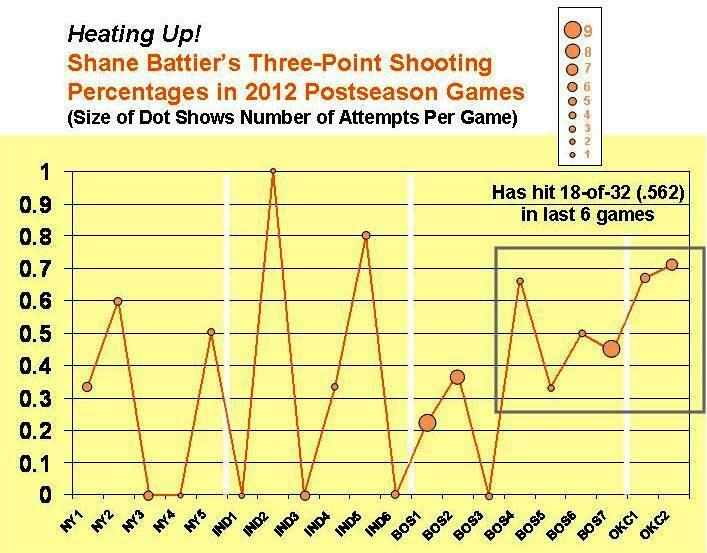 Not far behind, however, is the way Heat forward Shane Battier, the 11-year veteran from Duke, has lifted his three-point shooting accuracy. Typically thought of as a defensive specialist, Battier wasn't exactly scorching from behind the arc in the regular season, registering a .339 percentage (62-for-183). 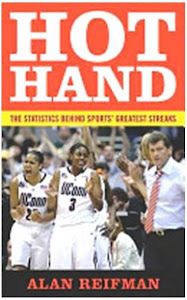 His game-by-game statistics are available here. His overall postseason shooting percentage on threes at this point is .371 (36-of-97), up slightly from the regular season. However, in the latter part of the Eastern Conference finals against Boston and now thus far against Oklahoma City, Battier is on a run that has him making more than half of his three-point attempts. The following graph shows his game-by-game three-point shooting in the playoffs, with his recent hot streak highlighted in a box on the right-hand side. 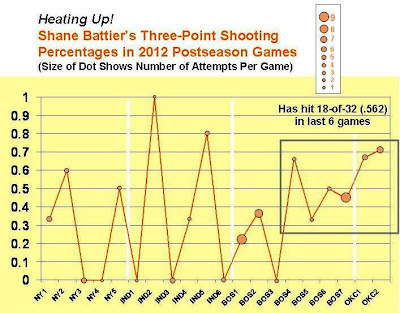 As depicted in the graph, Battier had a lot of ups and downs in his three-point shooting in the first round vs. the New York Knicks and the second round vs. the Indiana Pacers; however, in many of these games, he had few attempts. Now he's getting a lot more attempts, including 9 in the seventh game against the Celtics (of which he made 4), 6 in the opener against the Thunder (of which he made 4), and 7 in Game 2 against OKC (of which he made 5). There will be at least three more games in the final series. Whether the factors that have allowed Battier to shoot so well thus far, such as Oklahoma City's defensive scheme and a little old-fashioned luck (as on this shot that he banked in), continue in his favor, remains to be seen.